Red bell peppers are mild peppers belonging to the capsicum family. The origin of these peppers was in South and Central America and Mexico, where it was cultivated first. The name is derived because of its bell-like shape. These peppers are known to have a mild, sweet flavor. These amazing fruits are now available all over the world. These bell peppers are green in color when unripe, and they get their Red color once they ripen. Botanically Red bell peppers are fruits but many of us have known them as vegetables and use it in many dishes. These peppers are loaded with nutrients like vitamins C, A and B6. You can also find vitamin E, vitamin K, folate and potassium; and antioxidants as well in lesser quantities in them. Red Bell Peppers are rich in important antioxidant and anti-inflammatory nutrients which help to prevent serious diseases like cancer. The sulfur compounds found in them helps to prevent gastric cancer and esophageal cancer. Chronic excessive inflammation and chronic unwanted oxidative stress increases the risk of cancer. The phytonutrients present in Red bell pepper contains antioxidant and anti-inflammatory properties counteract environmental toxins and cell degradation and work to reduce the risk of cancer. Red bell peppers are loaded with Vitamin C and provide almost 300 percent of the recommended daily vitamin C requirement of the body. Vitamin C is a powerful antioxidant, and is vital for proper absorption of iron. People who have deficiency of Iron should include red bell peppers in their diet. Consuming red bell peppers helps in treating and preventing inflammation in the body. It also help in providing instant energy when you are overwhelmed with stress or feeling fatigued. 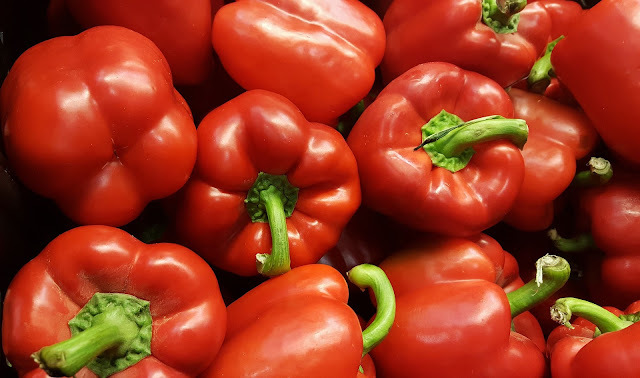 Red bell peppers are a good source of Vitamin B6 and the mineral magnesium, which is needed by our body to control the excessive anxiety levels. If you are having pre-menstrual symptoms then these compounds are essential for you. Having Red Bell pepper in your diet also reduces bloating and prevents hypertension. Red Bell peppers are a good source of vitamin A which is necessary to have healthy eyesight. A single cup of Red bell peppers provide almost 75% of the body’s daily requirement of Vitamin A. Its consumption helps to improve the vision especially the night vision. Important Compounds like beta-carotene and vitamin C are also present in it which helps to prevent cataract. Alos it contains a carotenoid called lutein which is known to help prevent macular degeneration of the eyes. Red bell pepper is an excellent option to be added in your weight loss diet. Its consumption will activate the process of thermogenesis and increase the metabolic rate of the body. It differs from other peppers as it increases the metabolism without increasing the heart rate and blood pressure thus they are very good for weight loss. Fiber is known to facilitate healthy digestion and maintain the cholesterol levels in the body. Just half a cup of red bell pepper is said to provide the body with about 1 gram of fiber. Consuming these Peppers work to protect the body against colon cancer and helps in the treatment of digestive disorders like constipation and irritable bowel syndrome. Red bell peppers are so healthy that including them in your diet can help to reduce the risk of developing chronic diseases like stroke, type-2 diabetes, heart disease, high blood pressure and some type of cancers. As mentioned above capsicum is a great source of potassium which helps to control the heart rate and maintains the healthy blood pressure in your body organs. Red bell pepper provides 7 percent of the daily value of potassium per cup. This mineral further helps to enhance the muscle function and in keeping the minerals balanced in the body. Red Bell peppers are the best source of vitamin C which is essential for the production of collagen. Collagen compound is necessary for healthy skin as it protects the cells from oxidative damage. Red bell peppers contain lutein, beta-cryptoxanthin and zeaxanthin which are cancer fighting carotenoids. These carotenoids are excellent for keeping the skin healthy. These carotenoids have a high silicon content which helps in reducing swelling caused by arthritis. Red bell pepper juice is also known for its healing qualities. As mentioned earlier Red Bell Peppers are an excellent source of vitamin C. Vitamin C is essential for hair health and further, helps in effective absorption of iron in red blood cells to carry oxygen to hair follicles. Vitamin C is also vital in the production of collagen which is needed by hair follicles for optimal hair growth. The deficiency of Vitamin C can cause serious hair problems like dry & split hair. Red Bell peppers improves the blood flow in the body and also the scalp which is needed for proper growth of hair and protection of hair follicles from the effects of dihydro testosterone (DHT). Application of a fresh paste of Red bell pepper on hair is highly effective in boosting the hair growth as it leads to improvement of blood circulation in the scalp. Take a few dry red bell peppers and boil them in water for 5 to 6 minutes. Now let them cool down, Now massage these boiled bell pepper on your scalp using a cotton pad and let it sit there for 10 to 15 minutes. Then wash off the hair. You can apply it twice a week to get best results.